Sutton-in-Ashfield optometrist Nigel Davidson has been given a prestigious national honour after giving his time and efforts freely to help people in the local community and beyond for more than two decades. Nigel, 55 was awarded a British Citizen Award for his services to volunteering and charitable giving. He was one of 36 medallists honoured at a prestigious ceremony last week, at the Palace of Westminster. Each received a Medal of Honour, inscribed with the words ‘For the Good of the Country’, and can use the initials BCA after their name. 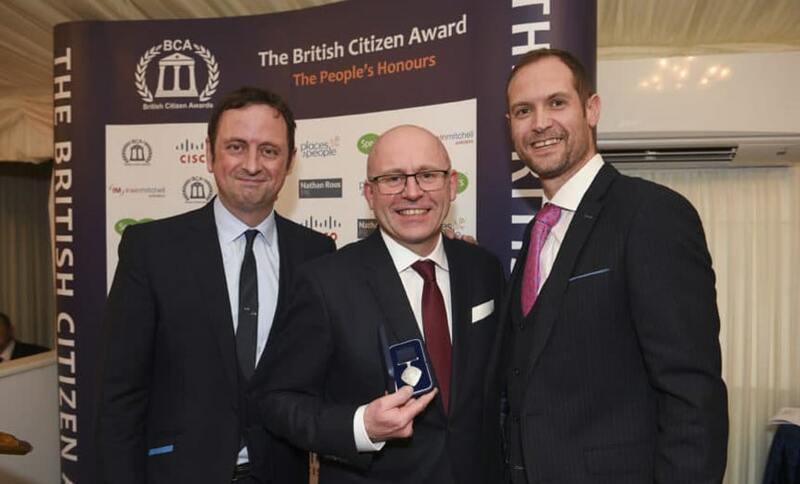 The British Citizen Awards (BCAs) were launched in 2015 to recognise exceptional individuals who work tirelessly and selflessly to make a positive impact on society. BCAs are awarded twice annually, and recognise ‘everyday’ people whose achievements may otherwise be overlooked. Nigel has been instrumental in raising thousands of pounds over the years for a myriad different charitable causes, including the British Heart Foundation, the Royal National Institute for Blind People (RNIB), the John Eastwood Hospice, Hearing Dogs, road safety charity Brake, the Ashanti Development and Children in Need. Nigel started the charity ‘Ashfield Eyecare Services’ in 2014 with the help of a grant from the Big Lottery Fund, delivering free eye tests and glasses to the homeless, refugees and asylum seekers in the Sutton in Ashfield area. Beyond this, Nigel and his team have developed strong relationships with the Sutton Community Academy school over the past eight years. The relationship began with the business accepting work placement students and since then several initiatives have been taken up, including a collaborative project with the store sponsoring the annual ‘Young Achiever in the Community’ Awards. His work also extends overseas, having joined expeditions to Ghana to provide eyecare to an impoverished area of the Ashanti in 2013 and again in 2015. On each occasion, Nigel sponsored practice team members to come along and help. During the most recent trip, the group carried out more than 1,300 eye tests in six days and handed out more than 4,500 pairs of donated spectacles.